An apology from Liverpool to the Snowdonia community it flooded to create its water supply has come "40 years too late", according to local people. 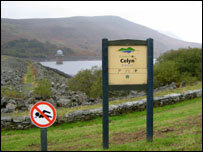 Liverpool City delivered a formal apology for the 1965 flooding of Capel Celyn for the Tryweryn reservoir. Some in nearby Bala welcomed the apology but others called it "useless" and a "political gesture". Most inhabitants were going about their business with little interest in the media descending on the farming community as Liverpool prepared to apologise. But bookshop owner Gwyn Sion Ifan said it had helped "alleviate some consciences in Liverpool but it is 40 years too late" and he resented it. Mr Ifan, 46, said he had not lived in the community at the time but he felt strongly about what he saw as an injustice to the community. "Call me sceptical if you like but in the end it's a political gesture," he said. He said the apology had been extracted at a time when there was an open invitation for the National Eisteddfod to be held in Liverpool and when the former president of Plaid Cymru, Gwynfor Evans, one of those instrumental in the protests had died. 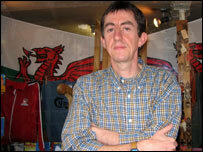 Farmers' Union of Wales employee Dei Charles, 55, from Llanuwchllyn, was a school leaver when the valley was flooded. He said he clearly remembered the drowning and the protests it provoked. The book seller described the move as " a political gesture"
"At that age you weren't really politically minded but it was a disaster for the little valley of Capel Celyn and people losing their homes and having to move out, " he said. "The generation that was moved out - they were the third, fourth generation living in those places it was a big step for them to leave their homes and go somewhere else to live. "I know some people think that it was beneficial to some of the people that they were paid and moved out - but in the end they lost their homes. "It's useless, it 40 years on, it's too a different generation. If you have done something to people 40 years ago and then apologise now I think they're empty words. 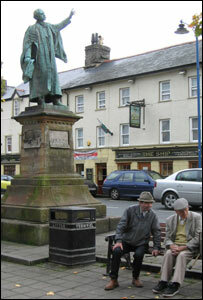 Retired teacher Trefor Lloyd's son was at the school in Capel Celyn at the time. "I remember his last day there - he came home quite sorry - he was only a little child of seven or eight. Mr Lloyd said he welcomed the apology and he had not got anything against Liverpool. "I happen to have been born in the hospital there because at that time that was the nearest hospital for anyone with complications. But he said the drowning was "disappointing at the time" and Liverpool had "driven roughshod over everything." Grandmother Mary Roberts, 80, who brought up her six sons and one daughter in Bala, said she remembered how the local community had gathered together at the time. "We all felt a bit down. We did not like to see the village going."